Every year I do a crafty little holiday party with the girls and a few of their friends. Last year I took on a few too many projects, but a favorite was felt ornaments. What I like about this project is just how flexible it is. It can be very easy for young kids or a little bit more challenging for older kids or grown-ups. Cut a few simple shapes out of the felt and kids can come up with all sorts of creative combinations. 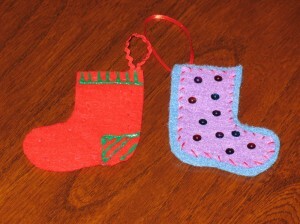 In fact, I’m trying this craft as my contribution to our big crafty-fest at our church this weekend. Hopefully everyone will like it, too. I cut felt into various sizes of stockings, trees, stars, gingerbread men, snowmen, and accessories like hats and scarves. I used cookie cutters and ornaments around the house to trace shapes. Kids could choose to glue or sew different pieces together. I had sequins, rick rack, embroidery thread, puffy paint, glitter, and buttons available as well. It was a satisfying craft. Philosophically I know that art is all about the process and not the product. 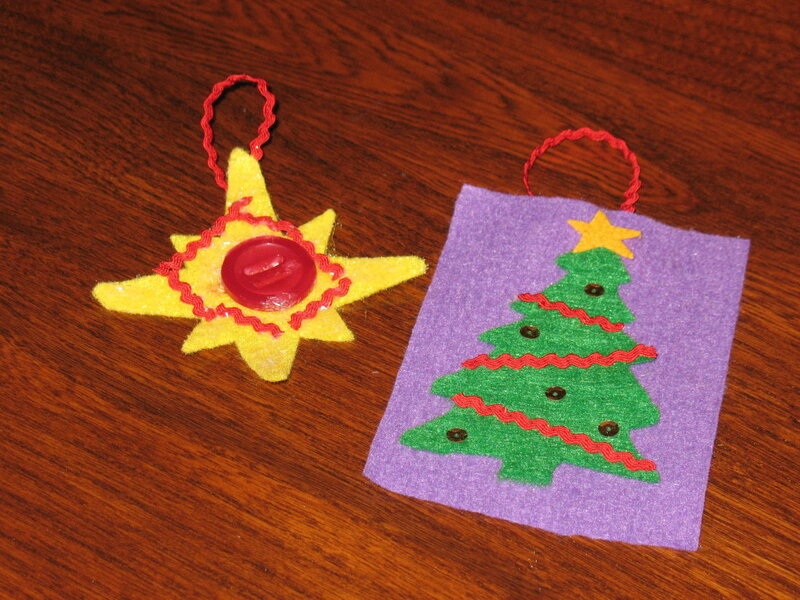 But when the kids can enjoy making something that turns out looking super-cute. . . well, come on. That’s even better.